There is hardly any other country where local residents move so often than the US. Migration is a customary thing for the Americans, so it is not surprising that the population of some states grows. Moving to Colorado is a reason why this state remains one of the fastest-growing states even despite a big number of out-migrants. The current population of the state is over 5.5 million people and the fifth part of this number has arrived in Colorado since 2000. However, there are things to know when moving to Colorado as many people still leave this state. Every year between 2011 and 2016 the population of the state was increasing by 60-75 thousand people. These numbers have been achieved by distracting the number of out-migrants (about 160-190 thousand people annually) from the number of in-migrants (about 235-250 thousand people each year). For the last three years, the annual increase in population was about 1.4%. Where do people leave for and come from? The biggest number of Colorado natives leaving the state to relocate to California, Texas, and Arizona. What is more astonishing is that most of the people who used to live in California decide to settle in Colorado – the biggest outflow of residents is from this state. However, there are many in-migrants coming from Arizona, Texas, Florida, and Illinois too. Another interesting fact is that in-migrants are predominantly young people with degrees and lower income, while out-migrants are an older population with a higher median income. The fact is that 14% of people who have once left the state because of different reasons return here again. Denver County is the most densely populated and fastest-growing in the state. What is the most interesting fact in this statistics is a big number of both in and out migrants, so it is not difficult to suppose that living in this state has its pros and cons and it is time to find out what they are. Many people ask for moving advice: if they should relocate to Colorado? But in fact, there is no sense to ask for any tips when you look at the number of benefits this state offers to its residents. 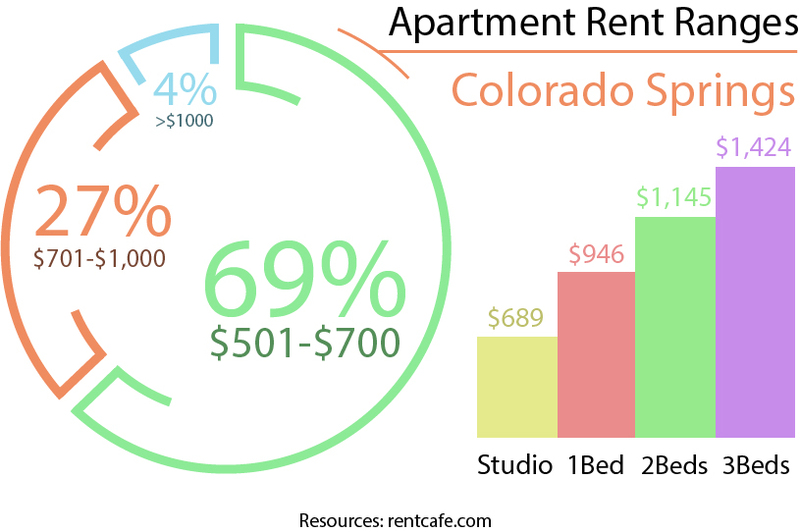 Colorado offers reasonable prices for people who live there. The overall cost of living index is 31% higher than the national average one. However, the main role in this difference is played by the prices for homes – they are almost twice higher than national average ones. Groceries and transportation are a little bit more expensive, while utilities and healthcare are even lower. Rental prices are also quite affordable. You need about $1,000 to rent a 1-bedroom apartment. Colorado can boast ones of the lowest taxes in the USA. Income tax is 4.63%; property tax is 0.55% average effective rate. However, if a general sales tax is estimated at the rate of 2.9%, every city and county can set additional sales taxes that may reach 11% in some cities. The climate of Colorado is greatly affected by the geography of the state. Most of the state area is covered with mountains, foothills, and high plains. The biggest part of the country features low humidity and not much precipitation; however, there is much sunshine and cool nights with a clear sky. At the same time, there are many microclimates from subtropical to subarctic depending on the altitude. It means that every person can find a climate that suits him most of all within one state. For example, Denver can boast 300 days of sunshine a year and even winters are rather warm there, let alone other cities and towns. Why is everyone moving to Colorado? The state has had a stable economic growth for several years already. It can boast one of the highest GDP in the US and it reflects on the quality of people’s lives too. Many industries continue the growth by creating many new jobs and the leaders in this sphere are construction, information technology, and trade. Thanks to the stable economic growth, the state can also boast one of the lowest unemployment rates in the country – it is less than 3%. Moreover, in 2017, WalletHub ranked this state #1 for job opportunities and #2 for being the most attractive state for employment. The Denver Post called job growth in Colorado the “strongest and most consistent”. Of course, there are people who are tired of the mountainous landscape, but you will never find a person who does not appreciate that beautiful scenery. Mountains are always mesmerizing. Moreover, they are a perfect place for outdoor activities both in summer and winter. You can enjoy rafting, climbing, cycling, hiking, backpacking, horse riding in warm seasons and enjoy ones of the best ski resorts in winter. There is more than 4.2 km of ski terrain located among 54 mountain peaks. There are also great wildlife watching opportunities too. What makes Colorado great for a living is the combination of the excellent work-life balance. You should not go far away to relax after a hard-working day as everything is located very close. It makes local residents ones of the healthiest in the country. People can take up sports here anytime and anywhere thanks to the variety of places to run, cycle, or walk at. No wonder, residents of Colorado suffer from obesity the least in the US. Are you a beer connoisseur? Undoubtedly, Colorado is a place where you can drink beer on a daily basis and never be fed up with it. There are over 230 breweries that constitute 10% of their total number all around the USA. Moreover, here you can find beer from the world-renowned companies and visit a unique festival held annually here. Colorado is often called the Napa Valley of Beer. If sports is an indispensable part of your life, be sure to enjoy it in Colorado endlessly. The Denver Metropolitan Area can boast 5 professional sports leagues in different kinds of sports including football, basketball, baseball, hockey, and soccer. Local teams have reached heights and won several important competitions, so they never disappoint their fans. Moreover, college sports are also developed at a very high level. It’s a controversial point if it is beneficial or not – we leave it up to you. Marijuana or cannabis is legal only in few states and Colorado legalized it in 2014 too. No wonder, smokers would rather move to this state to buy it legally instead of violating laws each time they would like to let their hair down. Moreover, there are many scientists who try to make a medical breakthrough searching for unique treatment possibilities of this plant and here, in Colorado, they can grow it officially and even run business in this sphere. Colorado offers many great cities for living. Despite the fact that many people appreciate living in Denver metropolitan area, Boulder has been ranked the fifth in the list of 100 Best Places to Live by Livability in 2016. You will not feel bored if you move to Colorado. In addition to a breathtaking landscape, there are four national parks, three historic trails, eleven national forests, forty-four state parks, and 307 wildlife areas to explore. Moreover, there are many places to enjoy the arts and culture of the state. You can visit multiple museums, performing art complex, zoo etc. There are many great places to do shopping including outlet malls and boutique and consignment store scenes. What to know before moving to Colorado? In fact, not everything is so good in this state and you may face the following disadvantages. 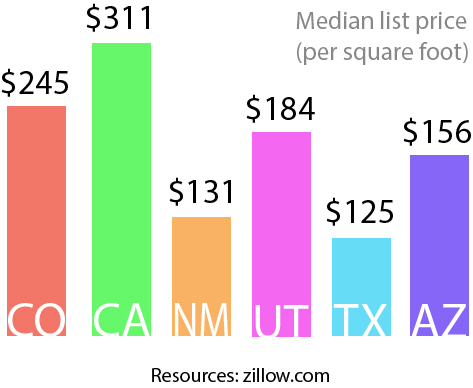 According to Zillow, the median sale price of homes in Colorado in 2018 was $359,700. This price has grown by 4.5% during the year. The average annual home price growth is about 7-9%. For example, prices for homes in Denver are ones of the highest in Colorado, but experts predict that in 2019 they will continue to grow at least 6.8%. Mortgage rates will increase too. Despite the relatively good weather all around the year, relocation to Colorado must be considered thoroughly if you are afraid of thunder, lightning, and tornados. For the last ten years, they have happened in the territory of the state more often and led to poor consequences. Residents of Colorado generate 9.6 pounds of trash per one person each day. At the same time, there are only 58 landfills that will run out of space by 2024 already. Moreover, there is much trash in the streets and many cities and town look polluted. Colorado has its traditional cuisine that has been influenced by neighboring states as well. Many people taste Rocky Mountain Oysters never thinking that these are bull or bison testicles. Many dishes are served with green chili and it makes them very hot. Bison meat is incredibly popular too, as this state is the 4th largest producer of red meat. Relocation to Colorado can be connected with some medical issues, as in the case of the epidemic situation of any disease, the chances to catch it are very high. The state features the lowest rate of vaccinated population in the country – only 81.7% of children of the kindergarten age. People are moving to Colorado being not aware that it is the highest American state. The average elevation of the state is 6,800 feet while there are many peaks that are higher than 14,000 feet. Air is thinner there and there are apparent consequences caused by that. Moreover, being closer to the sun, many people say about a higher risk of getting skin cancer. 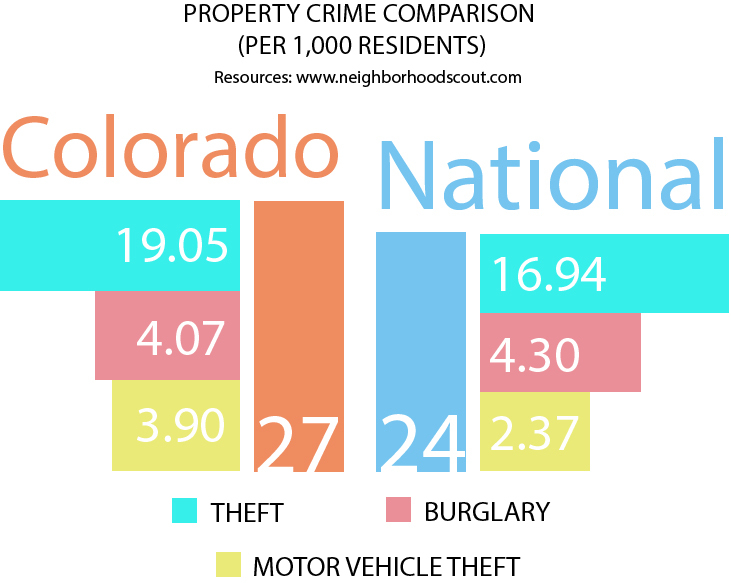 Unfortunately, the crime rate in Colorado is not that low as it could be. Only violent crimes are lower than the average national median – 3.68% in comparison with 4%. But when it comes to property crime, it is 3% higher than the national average one. Even the number of crimes per square mile is 15% higher than on average around the country. If you are thinking about moving to Colorado, it is important to choose a suitable place of living. The list of the top best cities and towns for living in Colorado begins with the following destinations. Being the largest by area and the 2nd most populated city in Colorado, it is also a popular tourist destination thanks to the mountains located there. The city can boast such highly developed industries as military and aerospace, high-tech and, of course, tourism. The city offers multiple attractions as well as considered to be the Olympic city. As it was already mentioned, this city was ranked the 5th among the best places for living. It is always ranked high art, health, education, and well-being. It is a city for a happy and measured life famous for its marathons, cycling routes, music, and dance shows. It is a capital of the state ranked number one almost in every moving advice. There is a nickname – the Mile High City – because of the impressive elevation it lies at. It is among the most populous and fastest-growing cities in the country as well as an impressive economic center. The city is famous for being a location for product storage and has become a key trading point in the USA. The city is chosen by many companies moving to Colorado as it took the first prize in the rating of the Best Places for Business and Careers by Forbes. This city takes the third place in the number of population in the state and is rather big in the area too. Aurora has become known to the whole world after a mass shooting in 2012, but now it is a safe place for living with great job opportunities in healthcare, military, education, and government. Being known as a “Steel city”, Pueblo is one of the major steel producers in the country. It is one of the cheapest cities in Colorado and the sixth most affordable place for living in the USA. Other things that make this city outstanding are being a source of renewable energy, a location of the largest state fair, and many touristic sights. Named due to its location this “River city” has reached a title of the major mountain biking destination in the USA. Today, it is also a luxurious ski resort that features other developed industries like healthcare, agriculture, energy mining, education, and retail. Being a college city it is home to Colorado State University. However, this city can be also proud of such well-developed industries as high technology, energy, and bioscience. It is proud of its microbreweries, parks, artistic and cultural life. One of the main states that provide residents to Colorado has always been and remains California. Why are Californians moving to Colorado? Almost every person will tell you about the cost of living. High prices for homes and other miscellaneous spendings make people look for more affordable places for living, and now about 6% of Colorado residents are native Californians. In 2016, about 27,000 people arrived in Colorado from the Sunshine state and they continue to do that now as well. It is not easy to move to another state being not aware of the basic relocation tips. Though it may sound trivial, it is much more affordable, comfortable, and safe to order services of the professional moving company than try to cope with this stressful task yourself. California Movers is always at your service if you plan relocation. Our dedicated and friendly movers will help you with both commercial and residential moving for any distance. Moreover, our extensive range of moving services allows getting the professional assistance in one place and save your money. It is always easier to move to another state if you are prepared for this. That is why we offer you a guide for those moving to Colorado so that your new stage of life was hassle-free and positive. Warn companies, organizations, relatives, and friends about your date of leaving. Order services of a trustworthy moving company. Prepare your new home for the arrival of your belongings. Notify utility providers about the date of your moving in. Contact DMV office to change your driver’s license and car registration. Try to get to your new home when it is not dark yet, as driving at high elevation in the darkness is very dangerous. Look through the parking restrictions and prepare for paying tolls. Choose summer or autumn for relocation. Winter and spring feature heavy snowfalls that will make moving twice more stressful. Having analyzed all moving to Colorado pros and cons, now it is easier to make a decision if this state can become your new home and whether you are ready to withstand all the challenges that might await for you there.